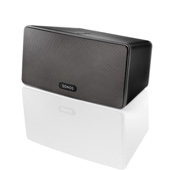 SONOS PLAY:3 is the versatile, all-in-one player with big sound in a compact size. With three integrated speakers and three digital amps, PLAY:3 streams all the music on earth wirelessly in any room for wall-to-wall sound. Go vertical or horizontal. Control with free apps for your Android®, iPhone® or iPad®. STREAM ALL THE MUSIC ON EARTH. Enjoy a universe of music everyday – your iTunes® library, your favorite music services, and more than 100,000 free Internet radio stations, shows and podcasts. Three integrated speakers and three dedicated digital amplifiers provide crystal-clear, high-quality sound. START WITH ONE, EXPAND ANYWHERE. Add as many Sonos players as you want throughout your home. Wirelessly. 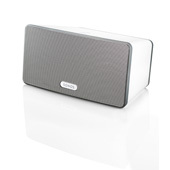 Play different songs in every room or the same song everywhere, in perfect sync. WIRELESS, EASY TO SET UP. No rewiring. No complex programming. Simply connect a SONOS BRIDGE to your wireless router and link all your Sonos players wirelessly with one touch. VERSATILE FOR ANY ROOM OR SPACE. Position the PLAY:3 vertically or horizontally and the internal sensor will modify the speaker's output to ensure clean, balanced, room-filling sound. Dimensions: (H) 5 in, (W) 10.5 in, (D) 6 in. STEREO PAIR FOR BIGGER SOUND. Turn two PLAY:3s into separate left and right channel speakers for big stereo sound in one room. Search, browse and play your music with the dedicated SONOS CONTROL or free Sonos Controller Apps for your Android®, iPhone®, iPod touch®, or iPad®. 2019 Stedman Ltd, LLC. All rights reserved.